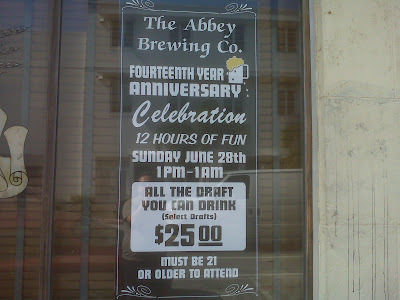 On Sunday, June 28th The Abbey Brewing Co. will be celebrating it's 14th year of business and what is better to celebrate with than beer. From 1pm till 1am you will be able to drink all you want of select drafts for only $25. If you don't know The Abbey this would be the perfect time to come check it out. The Abbey has been one of the longest supporters of craft beer in South Florida. They brew some great beers of their own and also have plenty of other fine beers on tap and in bottles. I went by today and they even have some special 14th anniversary shirts that they had printed up for the event so be sure to pick up one of those as well and spread the word about one of the best bars in South Florida(if not all of Florida). Come out and help them celebrate another great year of business and hopefully many more as well.